Caption slip reads: "Photographer: Gaze. Date 1955-04-28. Reporter: Gaze. Assignment: Fire prevention chief retires. 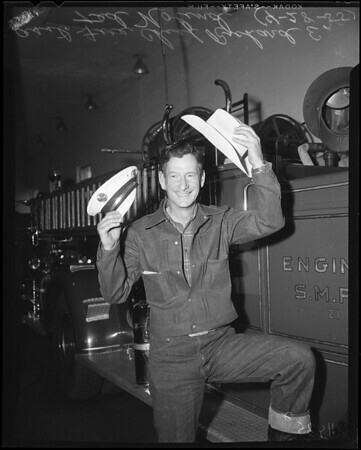 #81-82: Assistant Fire Chief Richard E. 'Ted' Nolind, who will retire tomorrow (Mon) switches from his chief's cap to a western hat -- he will operate a guest 'dude' ranch. #10: Assistant Fire Chief Richard E. (Ted) Nolind, who will retire tomorrow (Mon) puts his chief's cap aside in favor of western wear as he prepares to operate a guest 'dude' ranch."